The Bengal Famine of 1943-44 must rank as the greatest disaster in the subcontinent in the 20th century. Nearly 4 million Indians died because of an artificial famine created by the British government, and yet it gets little more than a passing mention in Indian history books. What is remarkable about the scale of the disaster is its time span. World War II was at its peak and the Germans were rampaging across Europe, targeting Jews, Slavs and the Roma for extermination. It took Adolf Hitler and his Nazi cohorts 12 years to round up and murder 6 million Jews, but their Teutonic cousins, the British, managed to kill almost 4 million Indians in just over a year, with Prime Minister Winston Churchill cheering from the sidelines. Australian biochemist Dr Gideon Polya has called the Bengal Famine a “manmade holocaust” because Churchill’s policies were directly responsible for the disaster. Bengal had a bountiful harvest in 1942, but the British started diverting vast quantities of food grain from India to Britain, contributing to a massive food shortage in the areas comprising present-day West Bengal, Odisha, Bihar and Bangladesh. “No one had the strength to perform rites,” a survivor tells Mukerjee. “Dogs and jackals feasted on piles of dead bodies in Bengal’s villages.” The ones who got away were men who migrated to Calcutta for jobs and women who turned to prostitution to feed their families. “Mothers had turned into murderers, village belles into whores, fathers into traffickers of daughters,” writes Mukerjee. Mani Bhaumik, the first to get a PhD from the IITs and whose invention of excimer surgery enabled Lasik eye surgery, has the famine etched in his memory. His grandmother starved to death because she used to give him a portion of her food. 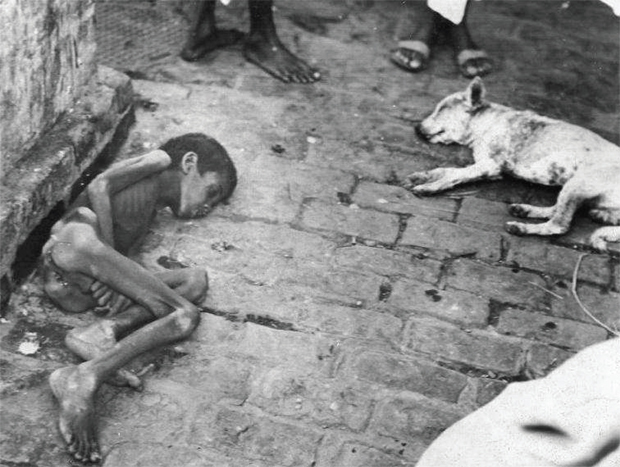 By 1943 hordes of starving people were flooding into Calcutta, most dying on the streets. The sight of well-fed white British soldiers amidst this apocalyptic landscape was “the final judgement on British rule in India”, said the Anglophile Jawaharlal Nehru. Churchill could easily have prevented the famine. Even a few shipments of food grain would have helped, but the British prime minister adamantly turned down appeals from two successive Viceroys, his own Secretary of State for India and even the President of the US . Subhas Chandra Bose, who was then fighting on the side of the Axis forces, offered to send rice from Myanmar, but the British censors did not even allow his offer to be reported. Churchill was totally remorseless in diverting food to the British troops and Greek civilians. To him, “the starvation of anyhow underfed Bengalis (was) less serious than sturdy Greeks”, a sentiment with which Secretary of State for India and Burma, Leopold Amery, concurred. Amery was an arch-colonialist and yet he denounced Churchill’s “Hitler-like attitude”. Urgently beseeched by Amery and the then Viceroy Archibald Wavell to release food stocks for India, Churchill responded with a telegram asking why Gandhi hadn’t died yet. Wavell informed London that the famine “was one of the greatest disasters that has befallen any people under British rule”. He said when Holland needs food, “ships will of course be available, quite a different answer to the one we get whenever we ask for ships to bring food to India”. Churchill’s excuse — currently being peddled by his family and supporters — was Britain could not spare the ships to transport emergency supplies, but Mukerjee has unearthed documents that challenge his claim. She cites official records that reveal ships carrying grain from Australia bypassed India on their way to the Mediterranean. Churchill’s hostility toward Indians has long been documented. At a War Cabinet meeting, he blamed the Indians themselves for the famine, saying they “breed like rabbits”. His attitude toward Indians may be summed up in his words to Amery: “I hate Indians. They are a beastly people with a beastly religion.” On another occasion, he insisted they were “the beastliest people in the world next to the Germans”. Churchill was not only a racist but also a liar. To be sure, Churchill’s policy towards famine-stricken Bengal wasn’t any different from earlier British conduct in India. In Late Victorian Holocausts, Mike Davis points out that here were 31 serious famines in 120 years of British rule compared with 17 in the 2,000 years before British rule. In his book, Davis tells the story of the famines that killed up to 29 million Indians. These people were, he says, murdered by British State policy. In 1876, when drought destituted the farmers of the Deccan plateau, there was a net surplus of rice and wheat in India. But the Viceroy, Robert Bulwer-Lytton, insisted that nothing should prevent their export to England. In 1877 and 1878, at the height of the famine, grain merchants exported record quantities of grain. As the peasants began to starve, government officials were ordered “to discourage relief works in every possible way”. The only relief permitted in most districts was hard labour, from which anyone in an advanced state of starvation was turned away. Within these labour camps, the workers were given less food than the Jewish inmates of Buchenwald, the Nazi concentration camp of World War II. Even as millions died, Lytton ignored all efforts to alleviate the suffering of millions of peasants in the Madras region and concentrated on preparing for Queen Victoria’s investiture as Empress of India. The highlight of the celebrations was a week-long feast at which 68,000 dignitaries heard her promise the nation “happiness, prosperity and welfare”. In 1901, The Lancet estimated that at least 19 million Indians had died in western India during the famine of the 1890s. The death toll was so high because the British refused to implement famine relief. Davis says life expectancy in India fell by 20 percent between 1872 and 1921. So it’s hardly surprising that Hitler’s favourite film was The Lives of a Bengal Lancer, which showed a handful of Britons holding a continent in thrall. The Nazi leader told the then British Foreign Secretary Edward Wood (Earl of Halifax) that it was one of his favorite films because “that was how a superior race must behave and the film was compulsory viewing for the SS (Schutz-Staffel, the Nazi ‘protection squadron’)”. While Britain has offered apologies to other nations, such as Kenya for the Mau Mau massacre, India continues to have such genocides swept under the carpet. Other nationalities have set a good example for us. Israel, for instance, cannot forget the Holocaust; neither will it let others, least of all the Germans. Germany continues to dole out hundreds of millions of dollars in cash and arms aid to Israel. Armenia cannot forget the Great Crime — the systematic massacre of 1.8 million Armenians by the Turks during World War I. The Poles cannot forget Joseph Stalin’s Katyn massacre. The Chinese want a clear apology and reparations from the Japanese for at least 40,000 killed and raped in Nanking during World War II. And then there is the bizarre case of the Ukrainians, who like to call a famine caused by Stalin’s economic policies as genocide, which it clearly was not. They even have a word for it: Holodomor. And yet India alone refuses to ask for reparations, let alone an apology. Could it be because the British were the last in a long list of invaders, so why bother with an England suffering from post-imperial depression? Or is it because India’s English-speaking elites feel beholden to the British? Or are we simply a nation condemned to repeating our historical mistakes? Perhaps we forgive too easily. But forgiveness is different from forgetting, which is what Indians are guilty of. It is an insult to the memory of millions of Indians whose lives were snuffed out in artificial famines. British attitudes towards Indians have to seen in the backdrop of India’s contribution to the Allied war campaign. By 1943, more than 2.5 million Indian soldiers were fighting alongside the Allies in Europe, Africa and Southeast Asia. Vast quantities of arms, ammunition and raw materials sourced from across the country were shipped to Europe at no cost to Britain. There is not enough wealth in all of Europe to compensate India for 250 years of colonial loot. Forget the money, do the British at least have the grace to offer an apology? Or will they, like Churchill, continue to delude themselves that English rule was India’s “Golden Age”? Wow, I had no idea. That’s awful. Thank you for sharing this.